HONOLULU – The Hawaii Department of Transportation (HDOT) advises Oahu motorists of upcoming westbound lane closures on the H-1 Freeway Airport Viaduct as ongoing repairs to the concrete viaduct deck continue Friday night into Monday morning. Two right lanes will be closed on the H-1 Freeway in the westbound direction from the Keehi Interchange to the Hickam AFB/Naval Base Off-Ramp (Exit 15B) from 11:59 p.m. Friday, Dec. 26, continuously through 12:01 a.m. on Monday, Dec. 29. All freeway ramps to and from the airport will remain open. However, a detour route will be in effect to accommodate the work. 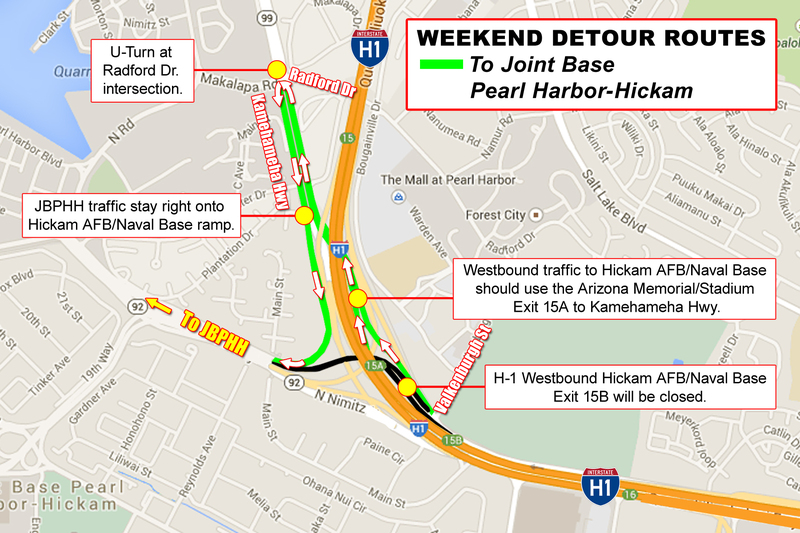 The Hickam AFB/Naval Base Off-Ramp (Exit 15B) to Joint Base Pearl Harbor-Hickam (JBPHH) will be closed. Westbound freeway traffic to JBPHH should use the Arizona Memorial/Stadium Off-Ramp (Exit 15A) to Kamehameha Highway and make a U-turn at the Radford Drive intersection. 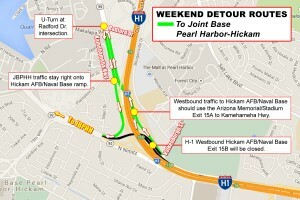 JBPHH-bound traffic should stay in the right lane and use the Hickam AFB/Naval Base exit ramp. Two right lanes on Nimitz Highway will be closed in the westbound direction between Elliott Street and Valkenburgh Street as a precaution due to the deck repair work above. Although no work is being done on Nimitz Highway, these closures ensure the safety of motorists as concrete hydro-demolition work is taking place above. Motorists are advised that the H-1 Freeway speed limit will be reduced to 15 MPH through the work zone area in order to minimize traffic-induced vibrations that may lead to bubbles forming in the newly poured concrete. In addition, this reduced speed ensures the safety of both motorists and construction crews working on the viaduct. The HDOT urges drivers to allow for extra travel time and to drive slowly and safely through the work zone area. Lane closure information will be distributed to the media, available on the HDOT website at hidot.hawaii.gov, and released through our social media channels on Facebook and Twitter, #hitraffic.